Since we’re going through a complete redesign of our apartment, I thought I’d share some of the things that I’m obsessed with on Etsy which is the best site for all things shopping. I mentioned in a previous post that I went through great logistical lengths to ship a suitcase chair from Capetown. I discovered it on a design magazine and absolutely had to have it. They’re unique and simply cute! Similar items can be found on Etsy. They’re probably easy to make, too, but I buy; I do not create. 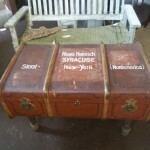 I’m dying to have this, but unfortunately it doesn’t fit in our small apartment. Although I hated that movie Pretty in Pink, I’m obsessed with the color pink. 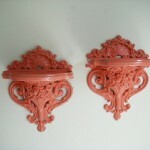 I never considered myself girly, but I so adore anything pink, including these shelves that made the editors’ picks. I mean, look at my very own blog, it’s pink! Or at least it has pink undertones. This has nothing to do with home furnishings, but fur is really in right now and I have jumped on that bandwagon. However, I am not someone who rolls with the fashion trends. For example, everyone in America wears jeans and I absolutely do not. I live for leggings. Jeans are the most uncomfortable apparel item. I’m shocked that people wear them daily. But back to fur, I’m all over it. It keeps me warm and gives my outfit all the more flair. I spotted a fur scarf at H&M on the Upper East Side in NYC. It didn’t have a price tag so I brought it up to the cashier. This is a Reiss fur coat which I definitely cannot afford, but happy to report that I’m heading back to the next Alameda Antique Fair to buy a fur coat. The vendor is out of her mind because she’s charging nothing for a real rabbit fur coat. I didn’t have enough cash on me last time and made her promise to bring it next month.